Mutations in factor H (CFH), factor I (IF), and membrane cofactor protein (MCP) genes have been described as risk factors for atypical hemolytic uremic syndrome (aHUS). This study analyzed the impact of complement mutations on the outcome of 46 children with aHUS. A total of 52% of patients had mutations in one or two of known susceptibility factors (22, 13, and 15% of patients with CFH, IF, or MCP mutations, respectively; 2% with CFH+IF mutations). Age <3 mo at onset seems to be characteristic of CFH and IF mutation–associated aHUS. The most severe prognosis was in the CFH mutation group, 60% of whom reached ESRD or died within <1 yr. Only 30% of CFH mutations were localized in SCR20. MCP mutation–associated HUS has a relapsing course, but none of the children reached ESRD at 1 yr. Half of patients with IF mutation had a rapid evolution to ESRD, and half recovered. Plasmatherapy seemed to have a beneficial effect in one third of patients from all groups except for the MCP mutation group. Only eight (33%) of 24 kidney transplantations that were performed in 15 patients were successful. Graft failures were due to early graft thrombosis (50%) or HUS recurrence. In conclusion, outcome of HUS in patients with CFH mutation is catastrophic, and posttransplantation outcome is poor in all groups except for the MCP mutation group. New therapies are urgently needed, and further research should elucidate the unexplained HUS group. Hemolytic uremic syndrome (HUS) is characterized by the triad of microangiopathic hemolytic anemia, thrombocytopenia, and acute renal failure, secondary to thrombotic microangiopathy (TMA) lesions. Postdiarrheal or typical HUS, the most frequent form in children, is caused by infection with Shiga toxin (Stx)-producing Escherichia coli. A variety of triggers for non–Stx-associated HUS have been identified, including Streptococcus pneumoniae and various nonenteric infections, viruses, drugs, malignancies, transplantation, or autoimmune disease.1–3 When there is no identified preceding illness, less frequently, the disease is known as atypical HUS (aHUS) and can occur at any age, from the neonatal period to adult age, with familial and sporadic cases.4,5 In patients with aHUS, mutations were reported in the genes of three proteins that regulate complement alternative pathway and protect host cellular surfaces from complement activation: Factor H (CFH), membrane co-factor protein (MCP or CD46), and factor I (IF).6–9 Up to now, at least 70 complement genetic abnormalities have been reported in adults and children with aHUS.10,11 It was shown that aHUS was secondary to complement dysregulation in approximately 50% of patients.12 In addition, acquired functional CFH deficiency as a result of anti-CFH antibodies has been reported in three children.13 The identification of congenital ADAMTS 13 deficiency reclassified a subgroup of aHUS as congenital thrombotic thrombocytopenic purpura (Upshaw-Schulman syndrome).14 The aims of this study were to document the frequency of each of these genetic complement-dependent risk factors of aHUS among pediatric patients and to provide a comprehensive characterization of the clinical findings according to the genetic background that could help to define prognosis and therapeutic guidelines according to clinicobiological characteristics. Among the 22 mutations, 13 have been reported by our group and were associated with complement haploinsufficiency9,15–17 and four were previously identified in unrelated patients with aHUS by other groups (CFH: S1191L, 1232delTAGA; IF: IVS12 + 5, G243D).10,12,18 Five new mutations were identified (CFH: A161S and Q635D; IF: I398L, I415V, and H165R). 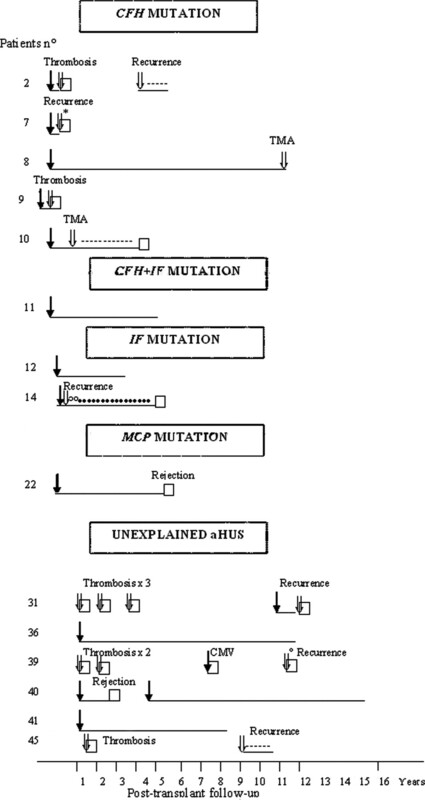 All mutations were scattered throughout the coding regions of the three genes, including CFH (Table 1). None of these mutations occurred in the controls groups. Six mutations were homozygous (three patients with CFH mutation, born from consanguineous parents, and three with MCP mutations). C3 levels were low in nine of the 10 patients with CFH mutation, the patient (patient 11) with CFH and IF mutation, four of the six with IF mutation, and four of the 22 with unexplained aHUS. C3 levels were significantly different among the four groups (P = 0.002) with levels being the lowest in the CFH and IF mutation groups (Figure 1). CFH levels were nearly undetectable in the three patients with homozygous CFH mutation and mildly decreased in five of the eight patients with heterozygous CFH mutation (including patient 11). IF levels were normal in all patients, including those with IF mutation. MCP expression was very low in the three patients with homozygous MCP mutation and approximately 50% of normal in the heterozygous patients. C3 levels according to complement mutation. —, Lower limit of normal C3 (660 mg/L, −2 SD). Patient 11 with CFH and IF mutation not shown (C3 290 mg/L). The gender ratio was similar among the group with or without complement mutations (Figure 2, Table 2). Fourteen patients had familial aHUS associated with CFH, IF, or MCP mutation in three, one, and one families, respectively. Four other families belong to the unexplained group (Table 2). In two families, only one of the two siblings with the disease had either CFH (patient 4) or IF (patient 16) mutation (Tables 1 and 2). In both families, the sibling with the mutation (patients 4 and 16) had a severe outcome, whereas the sibling without the mutation (not included in the study) had a favorable outcome. Age at onset of symptoms ranged from 1 d to 16 yr, with 32 (70%) of 46 with onset before age 2 (Figure 3, Table 2). Of the eight patients with onset before 3 mo of age, three had CFH mutation, four had IF mutation, and one had unexplained HUS. Seventy percent of the patients with CFH mutation (seven of 10) and 67% with IF mutation (four of six) had onset before age 1. No patient with CFH, IF, or CFH+IF mutations had onset later than age 4. No patients with MCP mutation had onset before age 1. Overall, age at onset was significantly different among the four groups (P = 0.02), the youngest being in the CFH and IF mutation groups. HUS onset followed a triggering event (upper respiratory tract infection, fever, diarrhea) in 29 (63%) patients from all subgroups. In particular, prodromic diarrhea preceded HUS in 13 (28%) patients from all subgroups, including infection with 0157:H7 E. coli in patient 20 with MCP mutations (Y155D and IVS8-2), familial HUS (brother of patient 21), and subsequent nonpostdiarrheal relapses (Figure 2). Age at onset of aHUS and outcome during the year after onset of the 46 patients. H, CFH mutation; I, IF mutation; MCP, MCP mutation; ?, unexplained HUS; ▒, ESRD or death during first year after onset; □, alive with functioning kidneys 1 yr after onset. Manifestations at the First Flare and Clinical Course. All patients except two presented with anemia with schizocytosis (mean hemoglobin [Hb] 6.7 g/dl [3.7 to 9.0 g/dl]) and 39 (85%) of 46 with thrombocytopenia (mean platelet count 55 G/L [5 to 145 G/L]). Thirty-eight (83%) of the 46 patients had acute renal failure at first flare of aHUS (mean serum creatinine 338 μmol/L [90 to 755 μmol/L]). Eight (17%) patients presented with proteinuria and hematuria, without renal failure (mean serum creatinine 54 μmol/L [40 to 63 μmol/L]). Eleven (24%) of the 46 had ESRD as soon as the first episode of the disease. Twenty-five (54%) patients had from two to nine new episodes of HUS at intervals from 1 mo to 9 yr, with nine patients having four episodes or more (Figure 2). The proportion of patients with relapsing HUS was not significantly different among the four groups (Table 2). However, overall number of relapses during the 10 yr after onset was significantly different among the four groups (P = 0.03), the highest number being in the MCP mutation and unexplained groups. Relapse with complete recovery was common in the patients with MCP mutation and unexplained HUS. By contrast, in the CFH mutation group, eight (80%) of 10 either died or reached ESRD at first flare (n = 5) or after relapses (n = 3), whereas an additional patient reached ESRD after 10 yr of follow-up. Three (50%) of the six patients with IF mutation either died or had ESRD, two of them at first flare. The patient with CFH+IF mutation had ESRD at first flare. Two (29%) of seven patients with MCP mutation had ESRD after one to two relapses 2 to 3.5 yr after onset, and one additional patient reached ESRD after seven relapses of HUS 37 yr after onset. Seven (32%) of the 22 patients with unexplained HUS either died (n = 1) or had ESRD (n = 6) at first flare of HUS or within a few months. One additional patient reached ESRD 15 yr after onset. Extrarenal involvement was uncommon. Four patients, including one with CFH mutation and three with unexplained HUS, had cerebrovascular events, as well as pulmonary involvement in one of the latter. Poor outcome, defined as death or ESRD within 1 yr after onset, was observed in 17 (37%) of the 46 patients (Figures 2 and 3, Table 2). Four (9%) of the 46 patients died within a few weeks or months after onset (from sequelae of cerebrovascular events, pulmonary hemorrhage concomitant with hemolysis and thrombocytopenia, Staphylococcus aureus septicemia, and multivisceral failure with diffuse TMA at postmortem histology). The risk for poor outcome (patient 11 not included) within the first year was significantly related to serum creatinine level at first episode. No other factors were found to be significantly linked with poor outcome during the first year (Table 3). 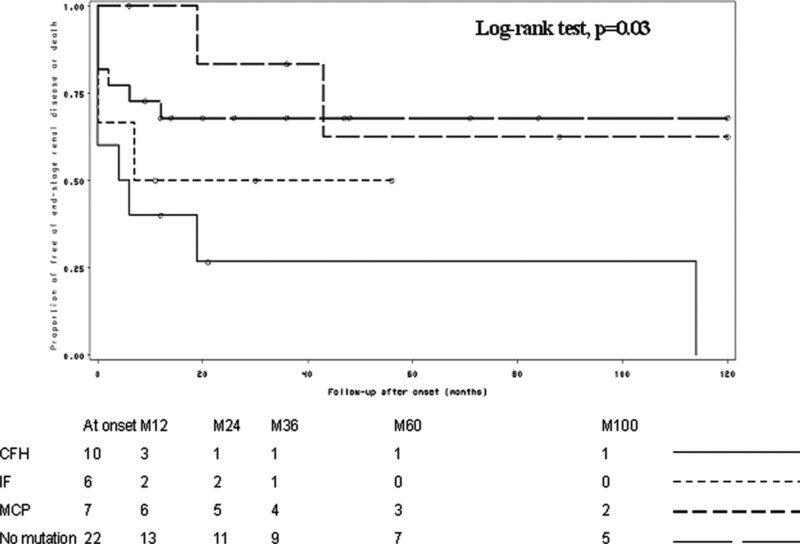 Overall, renal survival was significantly different among the four groups (log-rank test, P = 0.03; Figure 4). Indeed, at 1 yr after onset, it was 40.6% in the CFH mutation group, 50% in the IF mutation group, 100% in the MCP mutation group, and 68% in the unexplained group. At 5 yr, the percentages were 27, 50, 62, and 68%, respectively (Figure 4). Renal survival, according to complement mutation, up to 10 yr of follow-up. Patient 11 with CFH and IF mutation was not included. Twenty-two patients received plasmatherapy, most often daily during 7 to 10 d, and, when successful, subsequently tapered to once every week or every 2 wk (Figure 2, Table 2). Of the 22, 16 received fresh frozen plasma (FFP) infusions (10 to 20 ml/kg), four received plasma exchanges (PEX; 40 to 50 ml/kg per session) with FFP for volume restitution, and two received both treatments. Seven (32%) of 22 patients had a positive response, including two patients with homozygous CFH deficiency. Among the MCP mutation group, favorable outcome occurred in eight (89%) of nine episodes that were treated with plasmatherapy and 15 (88%) of 17 untreated episodes. A total of 24 kidney transplantations were performed in 15 patients (Figure 5), with cadaveric donors in all except one. All patients except one had bilateral nephrectomy before transplantation. Posttransplantation course. ↓, transplantation; —, functioning graft; ⇓, adverse event, as indicated; □, ESRD; *, FFP infusions; °, PEX; ---, long-term FFP treatment; ····, intravenous Ig. Sixty-six percent of patients (10 of 15) had at least one graft failure (Figure 5). During the first year, 12 (50%) grafts failed: Eight from thrombosis between 0 to 45 d after surgery, three from HUS recurrence, and one from cytomegalovirus infection. Six (25%) patients had an uneventful clinical course during 5 to 15 yr after transplantation. One of them (patient 8) had histologic TMA at graft biopsy 12 yr after transplantation. Two patients had functioning graft 2 yr after transplantation despite HUS recurrence. Four grafts were lost subsequently, from recurrence in two patients and rejection in two other patients. Among the five patients with CFH mutation, one of the six (16.6%) kidney grafts had an uneventful course during 12 yr after transplantation. The cause of early (<1 yr after transplantation) graft failure was HUS recurrence (n = 1) or renal artery thrombosis (n = 2). The patient with CFH+IF mutations had an uncomplicated course during 5 yr. Among the two patients who had IF mutation and received a transplant, one had an uncomplicated course and normal graft function 3 yr, 6 mo after transplantation. The other one had HUS recurrence at day 15 and returned to dialysis 5.5 yr after transplantation. The patient who had MCP mutation and received a transplant had an uneventful posttransplantation course but lost the graft after 5.6 yr from rejection as a result of noncompliance. Six children with unexplained aHUS received 14 renal transplants. Ten (71%) failed from early renal artery/vein thrombosis (n = 6), HUS recurrence (n = 2), rejection as a result of noncompliance (n = 1), or cytomegalovirus infection (n = 1). This article is the first to describe the genetic susceptibility factors and the clinical outcome in 46 children with aHUS. We demonstrate that aHUS with pediatric onset is a disease of complement dysregulation in roughly half of cases. We found CFH mutations in 22% of the patients and an equivalent percentage of IF (13%) and MCP mutations (15%). Three important clinical characteristics can be emphasized. The first is age at onset. Onset before 3 mo of age seems to be a characteristic of CFH and IF mutation–associated aHUS. By contrast, onset before age 1 has not been observed in children with MCP mutation, whereas unexplained HUS may start at any age, from the neonatal period to adolescence. The second is that creatinine level at first episode is significantly correlated with the risk for ESRD or death during the first year. The third important point is that the clinical course and prognosis were not similar in the various subgroups. The overall rate of ESRD was 43% (20 of 46), as reported in a series of pediatric aHUS.5 As previously observed by Caprioli et al.,12 we show that the most severe prognosis was in the CFH mutation group, 70% of whom reached ESRD during childhood, most frequently as soon as at first episode. The clinical course of MCP mutation–associated aHUS is clearly different: These patients have a relapsing course, but none reached ESRD at 1 yr. It is interesting that patients with IF mutation seem to have a more variable outcome, because half had rapid evolution to ESRD or death and half recovered. Patients with unexplained aHUS have a variable outcome, suggesting various pathophysiologic mechanisms. Familial forms accounted for 30.4% in our series, observed within all subgroups. We identified two cases of familial aHUS that illustrate phenotypic and genetic heterogeneity between siblings. In each family, only the sibling with either CFH or IF mutation had a severe outcome. These observations suggest the presence of additional uncharacterized genetic abnormalities. The two CFH and IF mutations might have as-yet-unknown functional consequences playing the role of severity factors. However, they could also correspond to rare polymorphisms (although they have been identified only in patients with aHUS and never in control subjects). We also observed that infectious episodes, especially gastrointestinal, appeared as triggering events of HUS in all subgroups.12 Moreover, E. coli 0157 infection was the triggering event of the first episode of HUS in one child with MCP mutation. Considering these results, diarrhea and even Stx-E. coli infection do not preclude the possibility that the underlying diagnosis is aHUS. This confirms that complement anomalies are risk factors rather than the only cause of the disease. Ten (22%) of the 46 patients with aHUS had CFH mutation, a proportion in agreement with that of 14 to 33% reported in the literature.12,19,20 As in our patients, the majority of CFH mutations reported in the literature are heterozygous. A total of 60% of the mutations published up to now are located within the C-terminal domain of the protein, particularly in SCR20, which induces a reduced ability of CFH to bind to surface-bound C3b and to the polyanions of the endothelial cells.10,11,21,22 However, in our pediatric patients, only 30% of CFH mutations were located in SCR20. Another 30% were in SCR15, and other mutations were scattered over the CFH gene. These data indicate that sequencing of CFH gene cannot be limited to SCR16 to 20 in children with aHUS, because this may miss 70% of CFH mutations. 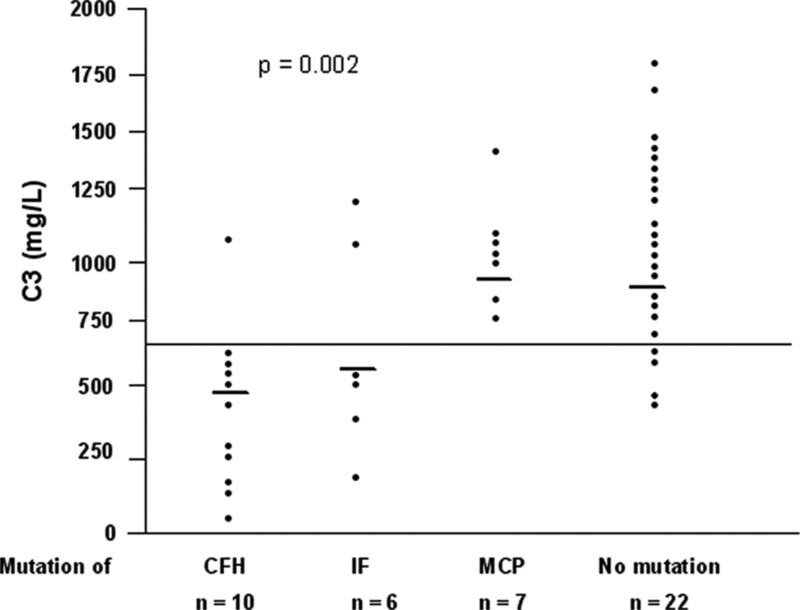 In addition, 72% of patients with CFH mutation presented with quantitative CFH deficiency as opposed to approximately 20% reported by Caprioli et al.12 The proportion of 15% of our patients who were found to have MCP mutation is in agreement with that of 10 to 15% previously reported.12,19 In our pediatric cohort, 13% of patients had IF mutation. This is more than the proportions reported (between 2 and 4.5%).12,19,23 The frequency of familial cases in each cohort or the sensitivity of methods for mutation detection may explain the difference. For the everyday practice, our data show that the association of early-onset aHUS and low C3 is indicative of CFH or IF mutation. However, the absence of low C3 is not predictive of a favorable outcome. We recommend determination of C3, CFH, IF, and MCP levels and complete genetic screening of CFH, IF, and MCP genes in all patients with aHUS. As reported by several authors, patients with homozygous CFH mutations were those who clearly benefited from receiving normal CFH by FFP infusions.24–26 However, the benefit of plasmatherapy is not clear for the majority of patients with aHUS. Most patients of our series received 10 ml/kg FFP infusions that may not be sufficient to change the severity of the evolution. A few case reports from the literature suggest that PEX that bring at least 40 ml/kg FFP are associated with a more favorable outcome in CFH mutation–associated aHUS.27,28 Two children with IF mutation in this series and a few cases in the literature18,23 seemed to respond to FFP infusions or PEX, which has some logic because IF is brought by plasma. In practice, recommended treatment for children with aHUS should be aggressive PEX therapy. The decision of this treatment is difficult in patients with mild renal involvement. The posttransplantation course analysis suggests several remarks. First, the overall success of transplantation was poor: Only eight (33%) of the 24 kidney grafts that were performed in 15 patients were functioning at last follow-up. It is interesting that a high proportion of failures were due to causes other than recurrence, mainly vascular thrombosis (eight of 16 graft failures). This has not been previously reported and suggests additional risk factors to thrombosis in patients with aHUS. In our pediatric series, posttransplantation HUS recurrence occurred in 53% of the whole group of aHUS and in 80% of patients with CFH mutation, a proportion similar to that of 74% reported by Bresin et al.29 The reason that 20% of patients with CFH mutation have no recurrence is unknown. The reported risk for posttransplantation HUS recurrence in patients with IF mutation was 100%.30 Nevertheless, among the two patients with IF mutation in our series who received a transplant and who happened to have the same nucleotide substitution, one had HUS recurrence and the other one had no recurrence during the 3 yr of follow-up. Amazing, the patient with both CFH and IF mutation had an uncomplicated posttransplantation course. The only patient with MCP mutation of our cohort who received a transplant had no recurrence, as most frequently observed in patients with MCP aHUS,30 a logic issue because one may expect that the graft brings normal MCP. Another noticeable observation is that in several patients, the posttransplantation course was less severe than that of the native HUS. Overall, of eight patients with posttransplantation HUS recurrence, five (62%) had preserved sufficient graft function during at least 1 yr, up to 5 yr. Several groups have reported the influence of polymorphisms of MCP and CFH in the susceptibility to HUS.19,31,32 The reason that posttransplantation HUS recurrence may be less severe than primary HUS could be related to the important role of MCP, a protein that is highly expressed in the kidney, in the severity of the disease. The outcome of HUS in patients with CFH mutation is catastrophic. New therapies are urgently needed. Liver or combined liver and kidney transplantation has been disappointing,33–35 until the recent report of one successful case under plasmatherapy.36 Intensive plasmatherapy is the only therapeutic option. The administration of CFH concentrate to treat HUS and to prevent posttransplantation recurrence ought to be an easier option in a near future. HUS first episode and relapses were defined on the basis of Hb levels <10 g/dl with fragmencytosis and/or thrombocytes <150 G/L, serum creatinine >97th percentile according to age, and/or proteinuria >1+. Criteria for aHUS were age of onset before 3 mo and/or absence of diarrhea and/or progressive onset and/or relapses of HUS and/or familial HUS. Remission was defined by normalization of Hb and thrombocytes count and normalization or stabilization of serum creatinine level. These criteria also defined positive effect of plasmatherapy, when observed within 10 d of treatment. Outcome category was classified as death, ESRD, or functioning kidneys. Informed consent for DNA analysis was obtained from parents and children when old enough. EDTA plasma samples were stocked at −80°C. 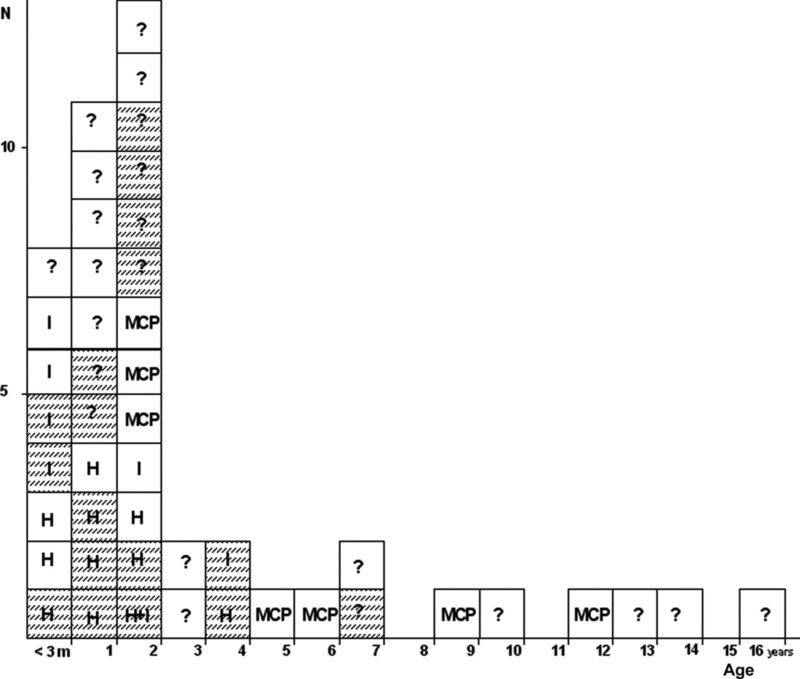 Plasma protein concentrations of C3 and CFH, IF, and MCP expression (using cytometry analysis with CD46 PE antibodies) were measured as described previously.9,16,17 Direct sequencing of all CFH, IF, or MCP exons was undertaken in all 46 patients. Primers have been previously described.6,12,15 To determine whether a mutation was also present in a control collective and therefore more likely be a rare polymorphism than a deleterious mutation, we analyzed a control population that consisted of 100 locally recruited white and 20 black healthy subjects. End point of the study was to analyze the risk factors of poor prognosis (ESRD or death). Results were expressed as numerical values and percentages for categorical variables and median (range) for continuous variables. Comparisons between groups were based on nonparametric tests. An event was defined by the occurrence of ESRD or death. Times to first event were computed between date of disease onset and date of first event and were censored at 10 yr (thus eliminating two events at 18 and 36 yr of follow-up). They were displayed using Kaplan-Meier curves and were compared between mutation groups by the log-rank test. A piecewise Cox model was fit to study the relationship between patient characteristics and ESRD or death within the year of onset. Results were expressed as hazard ratio (HR) and 95% confidence interval (95% CI). All tests were two-sided. Patient 11 with CFH and IF mutation was excluded from statistical analysis. This work was supported by the Délégation Régionale à la Recherche Clinique, Assistance Publique–Hôpitaux de Paris (grants P 010709, CRC 01019, and PHRC AOM 05130). We gratefully acknowledge the colleagues who participated in this study: E. Berard, Hôpital de l'Archet, Nice; P. Cochat, Hôpital Edouard Herriot, Lyon; P.H. Eckart, CHU de Caen; F. Janssen, Hôpital Universitaire Reine Fabiola, Bruxelles; and M. Seligman, CH de Luxembourg. Factor I Autoantibodies in Patients with Atypical Hemolytic Uremic Syndrome: Disease-Associated or an Epiphenomenon?